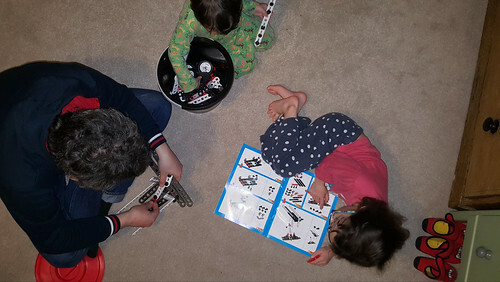 Bloke, Keiki and Humuhumu playing with Meccano on the childrens' bedroom floor. An Anonymous Benefactor sent a bucket of Meccano to us last weekend, and it has very quickly become a staple. We have begun to build the first of the objects in the instructions, a car. After the children have their bath and get into their pyjamas, they are allowed to complete five steps in the instructions. (Each item requires 25-30 steps.) Well, Humuhumu does the steps, with parental help. Keiki fishes nuts and bolts out of the bucket, then threads them through the holes in strips and periodically demands the screwdriver to tighten them. I have to hold the nut in place while he wields the screwdriver. It is a pleasing ritual. Our aim is to build all of the items in the instruction book by the end of the month. This entry was originally posted at https://nanila.dreamwidth.org/1133739.html. The titration count is at .0 pKa. They look to me having fun. Ahh the joys of Meccano, I grew up with it so its good to see another generation enjoying it. Yes, they are! Humuhumu is five and Keiki is three. They get on really well for the most part. Meccano is definitely a hit. I suspect they are hankering to go free-form as we're nearly done with the car, but they are mostly making pendulums with the remaining pieces.